Astronomers who study cosmic explosions have a running joke: anything too wild to explain with standard models are probably magnetars. These scapegoats are neutron stars with extremely powerful magnetic fields, like the one shown to the right. Super-luminous supernovae? Probably a magnetar collapsing. Short, weak gamma ray bursts? Why not magnetar flares. Ultra-long gamma ray bursts? Gotta be magnetars. 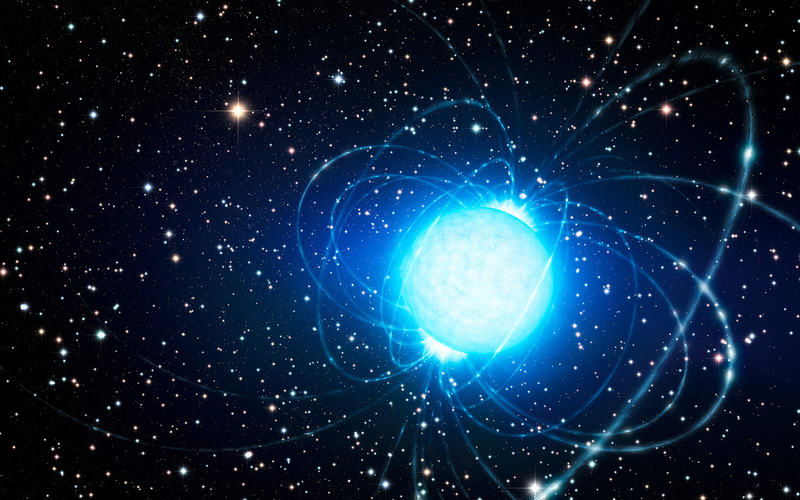 Magnetars are a popular model due to their natural versatility. In today’s paper, the authors tie together several magnetar theories into a cohesive theoretical explanation of two types of transients, or short cosmic events: super-luminous supernovae (SLSNe) and ultra-long gamma ray bursts (ULGRBs). Super-luminous supernovae, as their name suggests, are extreme stellar deaths which are about 100 times brighter than normal core-collapse supernovae. The brightest SLSN, ASASSN-15lh (pronounced “Assassin 15lh”), is especially troubling for scientists because it lies well above the previously predicted energy limits of a magnetar model*. The other new-kids-on-the-transient-block are ultra-long gamma ray bursts which are bursts of gamma-ray energy which last a few thousands of seconds. The other popular variety of gamma ray bursts associated with SNe are plain-old “long gamma ray bursts”, which last less than 100 seconds are often accompanied by a core-collapse supernovae. 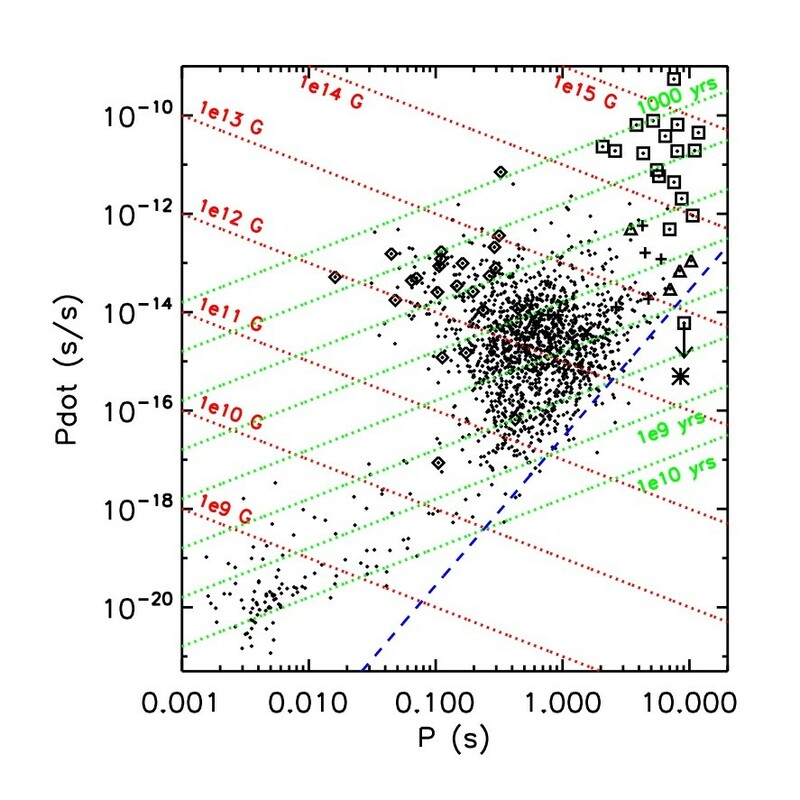 Both long gamma ray bursts and ULGRBs are currently predicted in magnetar models. The question is: can we tie these two extreme events, SLSNe and ULGRBs, together in a cohesive theoretical framework? The authors say yes! The basic theoretical idea proposed is that a very massive star will begin to collapse like a standard core-collapse supernova. The implosion briefly leaves behind a twirling pulsar whose angular momentum is saving it from collapsing into a black hole. Material is flung from its spinning surface, especially along its magnetic poles. From these poles, columned material is seen as high-energy jets, like you can see in this video of Vela. Eventually, the magnetars slow down and finally collapse into a black hole. 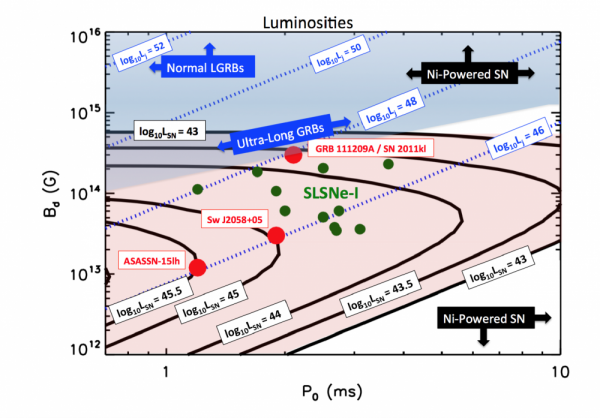 Fig 2: The connection between ULGRBs and SLSNe. Along the x-axis is is the initial spin-period of the magnetar. On the y-axis is the magnetic field of the magnetar. The red-shaded region shows where SLSNe are possible, and the blue-shaded region show where GRBs are possible. The red and green points are observed SLSNe. We can explain the consequences of the model using the image shown above. 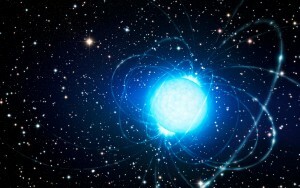 In the upper left quadrant, the magnetars spin very quickly (i.e. short spin periods) and have large magnetic fields. In this scenario, the escaping magnetar jets are extremely powerful and columnated, and the magnetar will spin down and collapse into a black hole after a few minutes. This scenario describes the typical long gamma ray bursts that we often see. Now if we move down and right on the figure, our initial magnetic field weakens and the period of the magnetar grows. In this case, the expected jet from the magnetar will weaken, but it will last longer as the magnetar takes a longer time to slow down its life-preserving spin. If the jet is able to blast its way out of the magnetar and is directed towards us, we will see it as an ULGRB, with a lifetime of about a half hour! One of the most exciting features of the plot are the solid black lines that show where the supernova luminosity is maximized. In these points, the luminosity of the supernova is enhanced by the magnetar, leading to super luminous supernovae. These lines are in great agreement with three notable, luminous SNe. It’s especially exciting that the black contours overlap with the region where ultra-long GRBs are produced. In other words, the authors predict that it is possible for a super-luminous supernova to be associated with an ultra-long gamma ray burst, tying together these extreme phenomena. One of the best tests of this theory will come from observations of ASASSN-15lh over the next several months. Ionizing photons from a magnetar model are predicted to escape from the supernova’s ejected material in the form of X-rays. Observations of these X-ray photons could be a smoking gun for a magnetar model of super-luminous supernovae, so stay tuned! *Note: At the time of this bite, ASASSN-15lh is not a confirmed supernova. It may be another exciting type of transient known as a tidal disruption event, which you can read all about here. Stellar evolution – a fascinating field of study.